EMF (electromotive force) is the voltage at the ends of a source when there is no current present. When the circuit is closed and a current flows then at the ends of the source there is a voltage that is smaller than the EMF. This is consequence of the internal resistance of the source itself which leads to this voltage drop. Electrically charged bodies can be obtained by separating electrons from the atoms by consuming some other type of energy, e.g. mechanical, light or chemical. Such separation exists in electrical sources. Due to the energy activity in the source an EMF is generated, which further induces a surplus of negative charge (negative pole) and lack of negative charge (positive pole). In electrical engineering the concept of EMF defines the work required to separate the charge carriers in a source of electrical current, in which the force acting on the charges at the ends of the source is not a direct consequence of the field. EMF is defined as the amount of work performed (A) in the energy transformation and the amount of electricity (Q) that passes through the generator E = A/Q. The unit is same as for voltage (V-volt). The device that supplies the circuit with electric power and produces electromotive force is referred to as the source of electromotive force or shorter EMS (electromotive source). There is a difference in the electrical states on the poles (terminals) of the source. There is a surplus of electrons on the negative pole, and a shortage of electrons on the positive one. In a closed current circuit, electrons move from the negative half to the positive half through the conductors and appliances. The difference between electric potentials is called electrical voltage [U]. The electrical voltage is equal to the amount of work performed by the electric force in moving the charge from one point of the field to another and that charge. The electrical voltage is measured in Volt [V]. The voltage measuring instrument is called a voltmeter. Electromotive force denotes the produced voltage inside the electric sources. Voltage is defined as the difference of electrical potential between two points, and this difference on the poles of the electric source is obtained by removing electrons from one part of the source and transferring them to another. The electromotive force of the source is equal to the work that some external force has to do to move the charge unit from one pole of the source to another, but through the source. Voltage in the outer part of the circuitry is much equal to the work that needs be done by the electric force to move the charge unit from one pole of the source to the other, but through the wire. The electromotive force is calculated as following: E=I*(R+r). 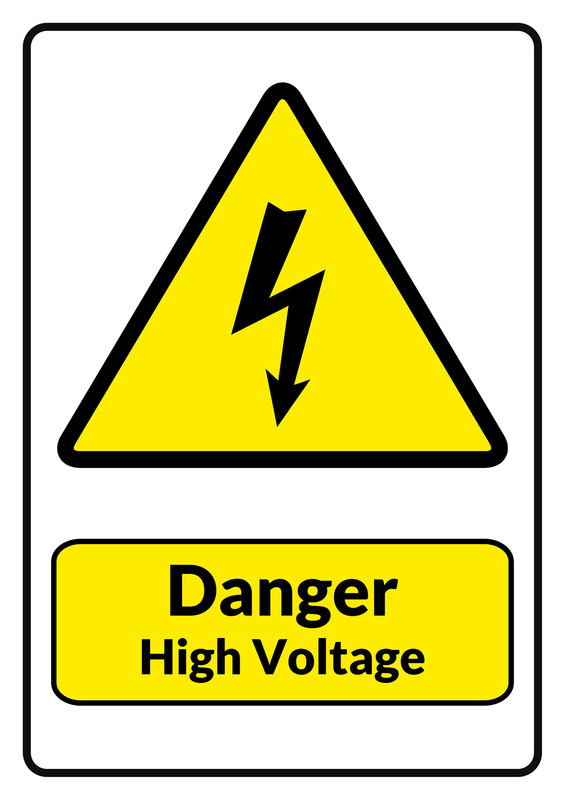 Voltage is calculated V=I*R (I – current flowing, R – load resistance, r – internal resistance). Voltage is an operation of the electric (Coulomb) force in charge motion and is the result of energy reduction in the circle, while the electromotive force is defined by a non-electric force (non-Coulomb) operation and is responsible for increasing the energy in the circuit. A potential difference (voltage) can be measured between any given points in the circuit, while electromotive force exists only between the two ends of a source. Also electromotive force is measured with EMF meter, while voltage with a voltmeter. The electromotive force is always greater than the voltage. The reason behind is that the voltage exist in a loaded circuit, and because of the resistance (energy loss) a voltage drop occurs. The magnitude of EMF is always constant, while voltages’ intensity differs. EMF can be caused in electric, gravitational or magnetic field, while voltage is caused only in electric field. The quantity adequately representing the generator as an element of the electric circuit and quantitatively characterizing its ability to maintain the current in the circuit and to convert other forms of energy into an electric one is called an electromotive force. 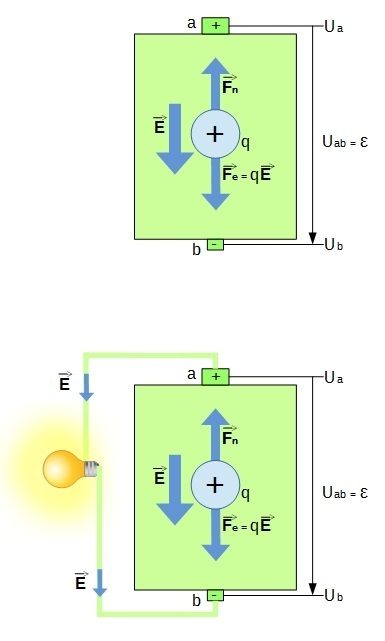 In order for the source to have a pole potential difference, the electrons need to be “moved” from one pole to another, that is, an operation for charge separating is required. A work performed on a charge unit by an external force by dividing the charges at the source of the electric current is called an electromotive force. The electromotive force (EMF) has a voltage dimension (Volt unit), and is also called internal voltage of the source (U0). The electromotive force is the same size as the potential difference between the positive and negative generator connections when it is in idle mode. The potential difference between two points of the electric field is called voltage, and the unit is also volt. The electric voltage is the cause of the flow of electrons in the electric circuit to (-) negative pole with excess of electrons, to the (+) positive pole with electron defect – the electrons move from (-) half to (+) pole. Emilija Angelovska. 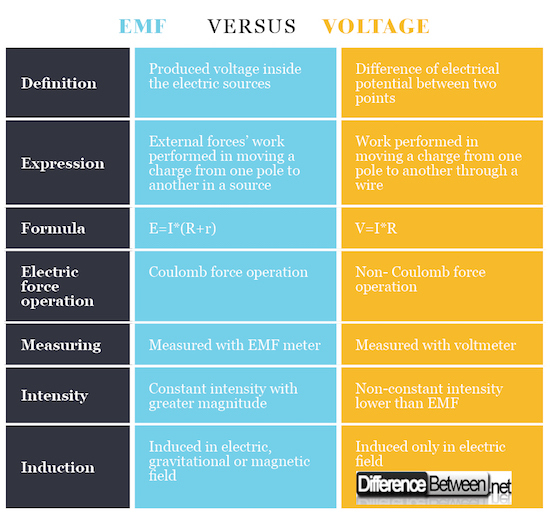 "Difference Between EMF and Voltage." DifferenceBetween.net. March 26, 2018 < http://www.differencebetween.net/science/difference-between-emf-and-voltage/ >. Griffiths, D. J. "Introduction to Electrodynamics", 3rd ed., NJ: Prentice-Hall, 1999. Halliday, D., Resnick, R., Walker, J. "Fundamentals of Physics", 6th ed., NJ: John Wiley & Sons Inc., 2001. Fishbane, P. M., Gasiorowicz, S., Thornton, S. T., "Physics for Scientists and Engineers", 2nd ed., NJ: Prentice-Hall, 1996.